Interstate 110 is a short freeway spur linking Interstate 10 and Mississippi 15 & 67 at D’Iberville with U.S. 90 (Beach Boulevard) and Downtown Biloxi. 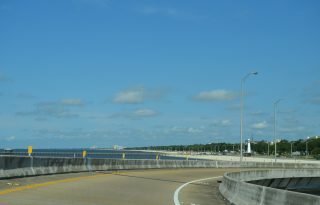 The freeway incorporates one of the few drawbridges in the Interstate system as it traverses the Back Bay of Biloxi between Exits 1D and 2. South from the span, I-110 travels along a four lane viaduct, with the trumpet interchange at U.S. 90 protruding partially over the waters of the Gulf of Mexico. Southbound Interstate 110 at the draw bridge signal on the Back Bay of Biloxi Bridge. Photo taken 10/12/16. Interstate 110 spurred south to the Bayview Drive ramps just across the Back Bay of Biloxi in 1977. MS-15 remained posted from there south along Caillavet Street to U.S. 90 by Downtown. The 1848 built Biloxi Lighthouse comes into view as the flyover from I-110 south to U.S. 90 (Beach Boulevard) east ascends over waters of Mississippi Sound. Photo taken 05/09/15. Mississippi 15 formerly cosigned with Interstate 110 for its entire length until March 2009. Opening at that time of the Biloxi – D’Iberville Scenic Expressway included a new alignment of Mississippi 67 to the southeast and a new trumpet interchange with Mississippi 15. As a result, MS-15 was truncated to the new MS-67, with MS-67 ending at the cloverleaf interchange with Interstates 10 and 110. MS-15 previously ran along Caillavet Street and Central Avenue to the east of I-110 through Biloxi and D’Iberville. Hurricane Katrina devastated the Biloxi and Gulfport area with its landfall on August 29, 2005. Long portions of U.S. 90 were virtually destroyed in the process, but Interstate 110 fared well and quickly reopened. Many of the signs within Biloxi for Interstate 110 were replaced, but otherwise the freeway remained unchanged. Spanning Rodriguez Street, the first sign for the full cloverleaf interchange interchange (Exits 4B/C) with Interstate 10 appears. Photo taken 11/20/15. A pair of Arrow Per Lane (APL) signs precede the departure of Exits 4A/B for Popps Ferry Road and Interstate 10 east. Photo taken 11/20/15. Two lanes branch away from the Interstate 110 mainline for Popps Ferry Road at D’Iberville and Interstate 10 east to Pascagoula and Mobile, Alabama. Photo taken 11/20/15. The Popps Ferry Road off-ramp opened in September 2015 to provide additional access to north D’Iberville and the Promenade retail area spreading north of the Interstate 10/110 exchange. I-10 eastbound otherwise travels with four overall lanes to Mississippi 609 at Ocean Springs. Photo taken 11/20/15. Exit 4B was renumbered as Exit 4C once the Popps Ferry Road off-ramp opened to traffic in September 2015. Exit 4A pictured here was moved further south as part of the new ramp. Signage for Interstate 10 west here remains the same other than a change to the exit tab. Photo taken 05/09/15. An End sign for Interstate 110 appears as Exit 4C loops onto the c/d roadway leading west toward Gulfport. Photo taken 11/20/15. Former guide sign posted 0.75 miles south of Exits 4A/B with Interstate 110. Exit 4A was shifted further south as part of the new ramp system for Popps Ferry Road in September 2015. Photo taken by Chris Patriarca (06/25/03). Mississippi 15 used to continue north from the Interstate 110 end toward DeSoto National Forest. The route now begins 2.3 miles further north from the Mississippi 67 expressway. Photo taken by Chris Patriarca (06/25/03). Approaching the original traffic light with Mallett Road, which then served just a handful of traveler services. Photo taken by Chris Patriarca (06/25/03). Mississippi 15 proceeded north from Mallett Road to cross the Biloxi River and curve west before turning north along a two-lane rural highway north to Mississippi 26 in Stone County. A 2009-opened four-lane expressway replaced a portion of this alignment northward. Photo taken by Chris Patriarca (06/25/03). Mississippi 15 & 67 advances south from the intersection with Old Highway 67 one half mile to the cloverleaf interchange with Interstates 10 and 110. Photo taken 11/20/15. The on-ramp from Promenade Parkway forms two auxiliary lanes from Mississippi 15 & 67 south to Interstate 10 west (Exit 4B). Photo taken 11/20/15. Mississippi 15 and 67 end as Interstate 110 south begins. Interstate 10 travels west from Exit 4B to Gulfport, Slidell and New Orleans in southeastern Louisiana. Photo taken 11/20/15. A loop ramp (Exit 4A) follows for Interstate 10 east to Jackson County, Ocean Springs, Gautier and Moss Point. Photo taken 11/20/15. The original cloverleaf interchange between Interstates 10-110 and MS-15 became increasingly congested once then Promenade shopping center opened for business in 2009. This view looks at the old single lane ramp for I-10 west. Photo taken by Chris Patriarca (01/19/03). 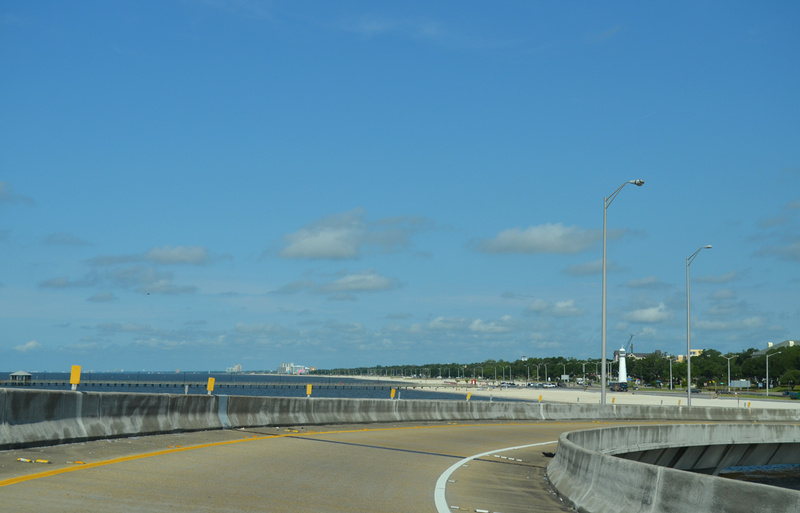 Mississippi 15 formerly combined with Interstate 110 south to U.S. 90 (Beach Boulevard) along the Biloxi waterfront. Photo taken by Steve Hanudel (08/14/05). Interstate 110 south cosigned with Mississippi 15. This stretch carries four southbound lanes now. Photo taken by Steve Hanudel (08/14/05). Interstate 10 expands from four to eight lanes between Mississippi 609 (Exit 50) and the junction with Interstate 110 (Exits 46B/A). Photo taken 11/20/15. Exit 46 represents the joint termini of both Interstate 110 from the south and Mississippi 15 & 67 from the north. MS-15 & MS-67 split 2.3 miles to the north. Photo taken 11/20/15. Arrow Per Lane signs outline the two-lane collector distributor roadway from Interstate 10 west. The c/d roadway serves not only I-110, but also the Lamey Bridge Road off-ramp (Exit 46D). Photo taken 11/20/15. The c/d roadway parts ways with the westbound mainline for D’Iberville. Interstate 110 sees one exit in the city to the south. The Lamey Bridge Road exit and the adjacent MS-15 & 67 interchange with Sangani Boulevard and Promenade Parkway serve the adjacent retail area to the north. Photo taken 11/20/15. Exit 46C departs from the c/d roadway below the Lamey Bridge Road overpass. Mississippi 67 begins a 20.25-mile course northwest to U.S. 49 at Saucier here. Photo taken 11/20/15. Exit 46B loops away from Interstate 10 west for Interstate 110 south leading toward Biloxi and Keesler Air Force Base. Long range plans call for replacing this ramp with a flyover. Photo taken 11/20/15. Passing under the original Lamey Bridge Road overpass, motorists bound for Mississippi 15 north to DeSoto National Forest departed from the I-10 c/d roadway. Photo taken 06/01. Replaced guide signs at the southbound off-ramp for Interstate 110 and then-Mississippi 15. Photo taken 06/01. Interstate 10 east approaches the DDI (Exit 46A) with Galleria Parkway and Exits 46B/C with Interstate 110 and Mississippi 15 & 67. Photo taken 11/20/15. A fourth eastbound lane opens ahead of the collector distributor roadway for Galleria Parkway. The roadway initially opened in January 2015. Photo taken 11/20/15. Two lanes partition from the eastbound I-10 mainline for I-110 south to Biloxi, MS-15 north to DeSoto National Forest and MS-67 north to Cedar Lake. Photo taken 11/20/15. Exit 46A departs from the c/d roadway for Galleria Parkway, which is the former D’Iberville Boulevard and Old Highway 67. The roadway was part of the original alignment also of Mississippi 15, which I-110 replaced south into Biloxi. Photo taken 11/20/15. Interstate 110 leads motorists south from I-10 and MS-15 & 67 through D’Iberville to U.S. 90 west of Downtown and east of Keesler A.F.B. Photo taken 11/20/15. The former one mile guide sign for Interstate 110 & Mississippi 15 on Interstate 10 east. Widening and resurfacing were almost complete at the time of this photograph. One slight change to the sign assembly occurred by 2004. The white on brown Casinos placards were removed from I-110 signs and replaced with white on blue Beaches placards. Photo taken by Chris Patriarca (06/25/03). Approaching Exit 46A for I-110 & MS-15 south at the old D’Iberville Boulevard overpass on I-10 east. Widening of I-10 to six lanes was near completion by Fall 2003. Photo taken 10/14/03. 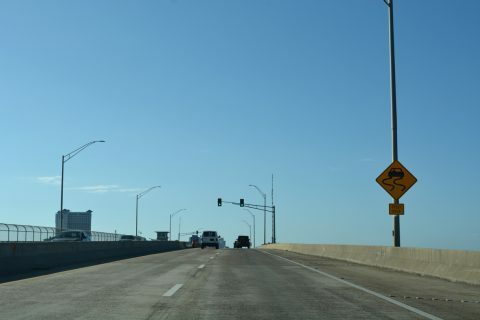 A pair of end advisory signs flank the southbound lanes of Interstate 110 as the freeway rises onto the Back Bay of Biloxi bridge from Rodriguez Street (Exit 2). Photo taken 11/20/15. A half diamond interchange (Exit 1C) connects I-110 south with Division Street at Hopkins Boulevard as the freeway makes its final half mile approach to U.S. 90 (Exits 1A/B). Photo taken 05/09/15. A second end sign references one mile for the flyover connecting I-110 south with U.S. 90 (Beach Boulevard) west to Downtown. Photo taken 05/09/15. The Interstate 110 southbound mainline defaults onto U.S. 90 (Beach Boulevard) west toward the main gate to Keesler Air Force Base. A flyover ramp serves casinos to the east and Ocean Springs in adjoining Jackson County. Photo taken 05/09/15. Exit 1B drops from the I-110 viaduct to a right-hand turn onto U.S. 90 (Beach Boulevard) west to Keesler AFB and Gulfport. Photo taken 05/09/15. Exit 1A loops over waters of the Gulf of Mexico before joining U.S. 90 (Beach Boulevard) eastbound ahead of Caillavet Street (historic MS-15). The I-110 Loop Walk appears below as an elevated pedestrian path circumventing the interchange. Photo taken 05/09/15. Replaced guide signs and removed light fixtures at the Division Street off-ramp (Exit 1C) on I-110 south. Photo taken by Chris Patriarca (06/25/03). Sign changes made here replaced Next Right with Exit 4A while removing the lighting array for U.S. 90 east. Photo taken 10/14/03. Traffic partitioned into ramps (Exits 4A/B) for U.S. 90 (Beach Boulevard) below these former guide signs. Photo taken 10/14/03. Biloxi Lighthouse appears as U.S. 90 (Beach Boulevard) leaves the Keesler AFB area and approaches the south end of Interstate 110. Photo taken 06/09/10. The flyover for Interstate 110 north to D’Iberville, I-10 and MS-67 departs from U.S. 90 (Beach Boulevard) along side a public beach. Photo taken 04/05/12. This shield assembly was removed once Mississippi 15 was truncated northward from Biloxi to the Biloxi – D’Iberville Scenic Expressway. Photo taken 09/16/00. Original signage posted for Interstate 110 north from U.S. 90 omitted cardinal direction banners. Photo taken 09/16/00. U.S. 90 (Beach Boulevard) leaves an area of public beach and passes by a pair of casinos on the half mile approach to Interstate 110. Photo taken 05/09/15. A modified trumpet interchange joins U.S. 90 with the northbound beginning of Interstate 110. Right in and right out ramps connect the westbound lanes of Beach Boulevard with the freeway below flyovers serving eastbound traffic. Photo taken 05/09/15. One fourth of a mile east of the trumpet interchange with Interstate 110 & Mississippi 15 on U.S. 90 westbound by the Beau Rivage hotel and casino complex. This assembly was later dismantled and replaced by a new overhead further east. Photo taken by Chris Patriarca (06/25/03). Replaced guide sign referencing I-110 & MS 15 north from Beach Boulevard west. The building beyond the flyovers was demolished after Hurricane Katrina hit in 2005. Photo taken 10/14/03. The I-110 viaduct crosses over Howard Avenue and a CSX Railroad line ahead of the first northbound reassurance marker. Photo taken 05/09/15. What was the first northbound Interstate 110 reassurance shield, posted along side MS-15, preceded the on-ramp from Division Street. Photo taken by Chris Patriarca (06/25/03). U.S. Highway 90 History. http://www.mdothwy90.com/documents/US_90_Project_History.pdf MDOT web site. “MDOT announces updates on South Mississippi road projects.” GulfLive.com, June 2, 2014. “New Ramp on I-10 in D’Iberville Now Open.” WXXV, January 21, 2015. “Drivers react to Mississippi’s first Diverging Diamond Interchange.” WLOX, June 2, 2015. “D’Iberville and MDOT will celebrate the end of I-10/110 work.” Sun Herald, September 2, 2015. “D’Iberville bridge opens Thursday.” Sun Herald, July 22, 2013. “How important is one highway sign?” SunHerald, July 14, 2016. Page updated March 30, 2017.